This animation task has thrown up some interesting design choices and questions. At the start of the project, upon receiving the brief, it was suggested that we make our animations in an abstract style. This, from some of the examples shown from the early days of animation, might be most commonly interpreted as consisting of simple shapes, colours and lines with no real structure or meaningful progression throughout the animation, other than variation with the beat or melody of the accompanying music track. This sort of style can be seen for example in the short animation “A Colour Box” by Len Lye (accessed at: http://vimeo.com/6276547). This style is all well and good, and certainly has its merits in experimenting with animation techniques and music synchronisation, however, it did not really interest me enough to pursue it for this task. I instead opted for a more (albeit very loosely) plot-driven piece, with a defined character and progression through the animation. Where I brought in the abstract ideas, then, was with the events of the animation. Rather than seeking to animate this character going through some ordinary task or activity, I chose to portray a scene based more around the emotions or feelings associated with a specific activity (in this case, listening to music). I went about this by having a clear transition from the character simply walking along, to the activity taking place. This transition was primarily achieved by the initial lack, and then introduction of, the music track. I also added some visual cues such as a pair of headphones being dropped on to the character. The music that I created for the piece is meant to convey a sense of joy, and a carefree attitude that the character is portrayed to be feeling during the activity of listening to the music. The character is then animated moving around the screen in a way that is greatly exaggerated, and which defies the normal rules of motion and gravity. I have used this motion as a visual representation of the mood being represented, which in this section is meant to suggest an elation at the music which removes everyday worries, and therefore physical restrictions on the animated character. I also tried to make the piece humorous in nature, as it is quite a light hearted subject matter and I think that the humour works well with the exaggerated animations. The final animation can be found here. The next piece of work to be done towards the portfolio of mini-projects is an animation made using Adobe Flash. The task also calls for an original soundtrack for the animation, which should be produced using GarageBand. The animation should be roughly 15 seconds in length, and should fit on a canvas of 22mm by 16mm in size. This task will help me extend my skill set as I have only briefly used Flash to create animations in the past, and I have no experience at all with the GarageBand software, or any form of music production. While the task calls for only a simple soundtrack to last the required 15 seconds, I think even this will give me an insight into the creative processes involved with audio production, and let me get a feel for the area and see if it is something I would be interested in continuing with after the conclusion of the task. I will also, I think, benefit from going through the animation process in Flash, as it is an area I haven’t done anything in for a while, and so it will be useful for me to be refreshed on the techniques and practices that go with it. After I had produced the bouncing ball animation by hand, I realised several things. The first of these was that with such a small number of frames, it is quite hard to see small changes or deformations in the drawn shape. Because of this, the ‘squashing’ of the ball at the edges of the paper is not really exaggerated enough in the drawings to be entirely obvious in the final animation. This and many other reasons (primarily the ridiculous simplicity of the animation) cause me to acknowledge that what I produced is not very good as a piece, although it did serve well as a learning experience. Another thing that I learned is that hand animation is really not an area that is meant for me. My drawing abilities are not up to scratch to produce anything in this manner except the most basic of animations using simple geometric shapes without taking an extraordinarily long time trying to draw something more complicated. Due to this, I do not intend to continue much further with this particular form of animation, although I see the usefulness of this task in learning about the history and foundations of animation. Thanks to this task and my research around it, I have become more interested in animation as a whole, and am keen to try out some different methods and styles of it. I will focus, though, on more computer-generated areas where my drawing skills may not have so much of an impact. As I begun the hand-drawn 12 frame animation task, I had several ideas of what I could draw. My initial plan was to try to animate a typical human walking cycle, although I quickly realised that this would prove quite difficult due to a combination of needing to redraw the entire image for each frame and my lack of drawing skill. I then changed my plan to animate a simple ball bouncing around the imagined space of the page, as I felt I could probably manage to draw at least a semi-passable circle twelve times. I began by drawing the ball at the 4 cardinal directions on the page, hitting each of the edges and about to bounce off. To try to achieve this, I drew the ball slightly squashed in towards the edge each time. I then drew two transitional stages for each direction of motion, and again drew the ball as if it were being deformed, this time by the force of its motion and air resistance. Once I had the required 12 images, I took a photo of them and imported them to the computer, as I felt this would be the easiest and best way to show them in a digital form as an animation. I then appropriately framed the images and turned them into an animated .gif file using the ‘gifsicle’ command in a Terminal environment. The result of this can be seen below. The final bouncing ball animated gif image. I recently worked on a short animation project, whereby the goal was to create a simple 12 frame animation using hand drawings, in the style of a zoetrope animation. In taking this on I decided to look into the history of this form of animation, as this was the first time I had heard of the particular technique. The zoetrope is an early animation device which gives the illusion of motion in a series of still images. It is made up of simply a hollow cylinder (with vertical slits cut into the sides at regular intervals), on the inside of which is a strip made up of a sequence of static pictures. The device is then spun and a viewer can look through the slits to see the imagery inside. The spacing of the slits causes the images to appear to the human eye one after the other in rapid succession rather than blurring together, which much like a cinema projector creates the illusion of a moving image. The device can draw its roots all the way back to 180 AD and Chinese inventor Ting Huan, who created an early form of the zoetrope called ‘chao hua chich kuan’, which translates as ‘the pipe which makes fantasies appear’ (Needham 1962). The modern zoetrope however was invented in 1833 by British mathematician William George Horner (Thompson and Bordwell 2010). He named it the ‘daedalum’ and it later became popular in the 1860s upon being patented by English and American manufacturers. It was later improved upon and replaced by such devices as the praxinoscope and eventually modern film and television. However, the zoetrope retains its position as a large part of the origins of modern animation. Thompson, K. and Bordwell, D. 2010. Film history. New York, NY: McGraw-Hill Higher Education. 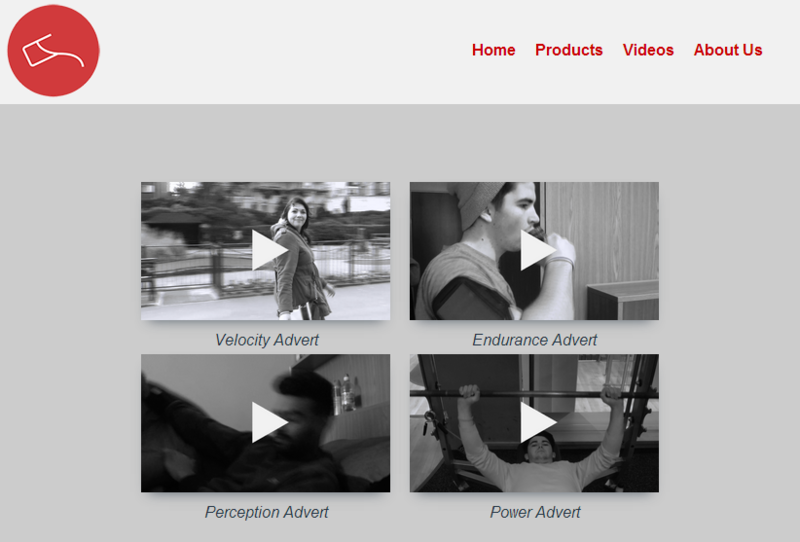 I have now completed the video page of the channel project website. I am pleased with the way it turned out, and with the methods I used to create it. I kept the page simple, with a responsive list of video thumbnails and titles which when clicked expand a video player containing the relevant video. This functionality was coded using PHP. The expanded video player section. 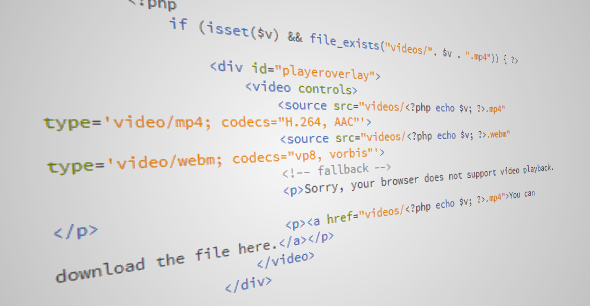 Some of the code behind the video player section. The entire page, including the video player itself, is fully responsive and the thumbnails will flow to best fit the current screen width. The video page at a medium width. The video page at a small width. I feel that the page has been a success overall. If I were to do a similar page in the future, I would like to include a flash fallback video for maximum compatibility, however due to the lack of flash on my own machine and the timing behind receiving the final rendered videos I have been unable to do this on this occasion. I have however encoded both mp4 and webm versions of t#every video to ensure compatibility across HTML5 video capable browsers. The final product can be seen here. When it comes to responsive web design, it is important to implement it properly for the whole site, including the navigation bar. When on a large desktop display, this bar can afford to be a simple row of links with visual styling. However, as displays start to decrease in size it is important for it to make appropriate use of the available screen real estate. There are multiple ways of doing this, of varying degrees of complexity. For my current channel project, I felt it was important to choose the right method of implementation for the navigation, so here I will discuss a few of them and my final decision. The first and perhaps the easiest method is to simply center the navigation and let the navigation bar links overflow onto new lines as necessary using simple CSS. 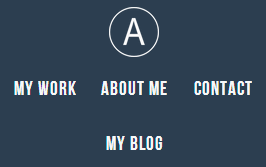 This is largely the approach I took for my personal website, although there I also moved the logo around the navigation at certain widths using media queries. This method is simple yet effective, and quick to implement. However, it can lead to a certain ‘jumbled’ aesthetic as the links may not be aligned, and it may not look very professional. The menu of my portfolio – at certain widths this approach can look a little odd. Another similar approach that somewhat solves this issue, is to use media queries to make all of the navigation links the same width and height below a certain size, and then have them overflow as before. This creates more of a grid, with uniform cell sizes. For example, each link could be set to a half or a third of the viewport width to create two or three columns of links respectively. This creates a more professional look. Yet another possible implementation of the menu is in a dropdown selection box. This has the advantage of being expandable and scrollable, and so being able to fit in large menus with possible sub-menus on the page without it constantly using the majority of the vertical space on the screen. It also may be familiar to many of the website’s users, as many applications use such selection items. There are other variations that also expand out when clicked so as to not be constantly using screen space, which I feel is an important aspect. One of these is to have the menu off the side of the screen, and then have it slide in at the touch of a button. This however has the disadvantage of using the entire vertical length of the screen when expanded. The non-expanded menu at small screen widths. The expanded menu, upon click of the menu icon.